Are you loving yourselves now? We all know that we should love ourselves, but it’s not as easy to do as it may sound. How do BTS members love themselves? One of the easiest and fastest ways to make yourself unhappy is to compare yourself to others. I’m quite fine as is! Looking for what you like to do, and discovering and developing within it something special for yourself – isn’t that the way to truly love yourself? Have you read the book Living, Loving & Learning that j-hope recommended on V live? The book is about how important it is to love yourself. Reading a book that suits you well and taking the time to discover yourself is another great way to love yourself. 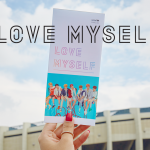 BTS’ message to the world is to ‘LOVE MYSELF’. You don’t have to do the things listed above; you can start with baby steps. Sharing a LOVE MYSELF post on your personal SNS or using the hashtag #BTSLoveMyself is enough. Please join us in our quest to make this message heard even louder throughout the world. The LOVE MYSELF campaign encourages people to love themselves and from that love look at the world with a warm heart. How about we start today by practicing loving ourselves in the ways BTS suggested? Don’t sweat it, just LOVE MYSELF! Are you loving yourselves now? We all know tha..